Smart phones present drivers with both a useful enhancement and a dangerous distraction. Consumers accustomed to being connected wherever they go don't want to give that up when they get into a car. Drivers stuck in traffic want to put that time to productive use. So automakers and suppliers are devising innovative and safe ways to pair cars and smart phones so consumers can monitor the condition of the vehicle as well as new postings on Facebook. "The automobile is no longer a communications dead zone that prohibits drivers from staying connected to friends and family," said Anna Buettner, an analyst at iSuppli, a consulting firm that specializes in automotive electronics. "With the expanding array of communications options, many drivers are willing to take the risk of an accident simply because they want to read or reply to a text message or check and update their preferred social media site," Buetner wrote in a recent report. "Finding and implementing a way to safely integrate social networking and other apps in the car is more feasible than fighting the trend." Multimode wireless connectivity -- Bluetooth, WiFi and cellular -- governed by flexible programmability is speeding the integration of smart phones into vehicles. But even when the goal is the same, approaches differ among automakers. The integration strategies of General Motors Co. and Ford Motor Co., for example, are dramatically different. Ford's strategy centers on its Sync voice-activated system. Sync, developed with Microsoft Corp. and launched late in 2007, provides multiple hard and wireless connections with smart phones and other mobile devices that drivers might bring into the vehicle. Sync revolutionized the control of MP3 players and cell phones by allowing drivers to control them through the vehicle's existing audio controls and structured voice commands. Ford says its research has shown that Sync makes using these devices less distracting. The automaker has improved and expanded the Sync interface several times. "We know we can do better things for our customers by allying with the companies that provide the devices and services customers already use," said Derrick Kuzak, Ford group vice president for global product development. "What we see emerging is a mutually beneficial collaborative community where our shared customer -- anyone who drives a car and owns a smart phone -- is the true beneficiary." Ford also has introduced an application programming interface for smart phones that allows smart phone apps to run and be controlled through Sync. The first programs to use the new Sync API are OpenBeak, Pandora and Stitcher. The vehicle's center screen mimics each app's smart phone appearance and function. OpenBeak provides a direct link to the Twitter social media site, while Pandora and Stitcher are popular Internet radio applications that compete with satellite radio. Additional apps are expected to become available through the online stores operated by Apple, Android and BlackBerry. In contrast to Ford's approach, which assumes consumers will bring their smart phones into the vehicle, GM's OnStar relies on a phone connection built into the vehicle. 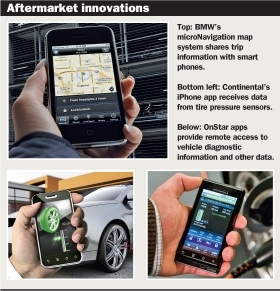 OnStar recently announced expanded smart phone apps for many 2011 Chevrolet, Cadillac, Buick and GMC models. When drivers use a secure login, the application enables remote access to information about diagnostics, remaining fuel level and range, current and recommended tire pressures and more. The driver's cell phone connects to the cell phone embedded in the vehicle. "We're working aggressively to bring the Chevrolet, Cadillac, Buick and GMC applications to market as soon as possible," said Joel Ewanick, GM's vice president of marketing. "We know that each brand's customers have different tastes, wants and needs. The apps will be very specifically tailored to offer them the services they value most, leveraging OnStar features as a compelling mutual foundation." Additionally, any function available on a key fob also is accessible through the OnStar app. This includes remote door locking and remote start. The advantage over a traditional key fob is range -- the OnStar app works wherever there is cell service. Monitoring the vehicle's status becomes even more important for electric vehicles, and both the Chevrolet Volt and Nissan Leaf feature apps for smart phones. Apps running on the Apple iPhone, Motorola Droid and BlackBerry Storm can show the vehicle's state of charge and estimated range. Additionally, the Volt and Leaf can be instructed to heat or cool the cabin while the car is attached to a charger. Adjusting the temperature while the car is connected to the power grid saves battery energy and thus extends the Volt's or Leaf's range on electric power. What's next? Aftermarket suppliers are coming out with apps that someday could become standard equipment on new vehicles. Mini drivers can download an iPhone app called the Minimalism Analyzer. The app puts a cheeky display graphic on the Mini's center screen to coach drivers toward more efficient driving. BMW AG, Mini's parent, says following the app's suggestions can improve mileage by as much as 15 percent. BMW also recently unveiled a prototype of its microNavigation map system. It can share trip information with smart phones when trips include nonautomotive segments, such as train travel or walking. It also remembers where the car is parked and displays the location on the smart phone's display. Continental AG has shown Automotive News a prototype iPhone app that receives data directly from the company's latest generation of tire pressure sensors. The app reads the signals sent from each tire and provides air pressure readings for those cars without a built-in tire pressure monitor display. CARbonga is an Apple iPad app that displays vehicle fault codes. Using a goLink cable connected to the vehicle's on-board diagnostic port, CARbonga provides access to codes that reveal, for example, why a "check engine" light might be illuminated or whether the vehicle's airbags ever have deployed. The app also notifies the consumer of automaker-issued technical service bulletins. Radar detector manufacturer Cobra Electronics offers an app called iRadar that enables an iPhone to communicate by Bluetooth with the Cobra radar/laser detector and works as the unit's visual display and warning indicator. Additionally, the iPhone enhances the detector's ability by providing it with constantly refreshed GPS data on the latest traffic camera and speed trap locations. The iRadar app is free to owners of certain Cobra detectors. "As authorities legislate hand-free phone use and as younger Americans raised with constant connectivity come of driving age, our vehicles will be ready," said James Bell, an analyst at Kelley Blue Book. "However, smart phone integration does not necessarily lead to smarter driving."